This week I had the privilege of attending Extreme Grace – the back to school retreat of Grace Prep High School (Bob & Dannah Gresh founded). They needed an extra female sponsor and I fit the bill! A three-hour bus ride, multiple random and disgusting games (including a cow tongue), hiking, junk food and playing in a creek led up to our culminating activity: white water rafting! This was a new experience for me – I am an adventure person so I was thrilled at the opportunity. However. The outside temperature read 64 degrees… the water temperature posted on the adventure board was an inviting 62. My excitement drained. I hate being cold! Yes, I invested in a very expensive, waterproof jacket for this very reason. May I just say, it was worth every cent! The boat I was in had so much fun and no serious issues. We ran most of the class 4 rapids with ease…well, they did. I held on to the side of the boat for dear life! I wasn't much help! 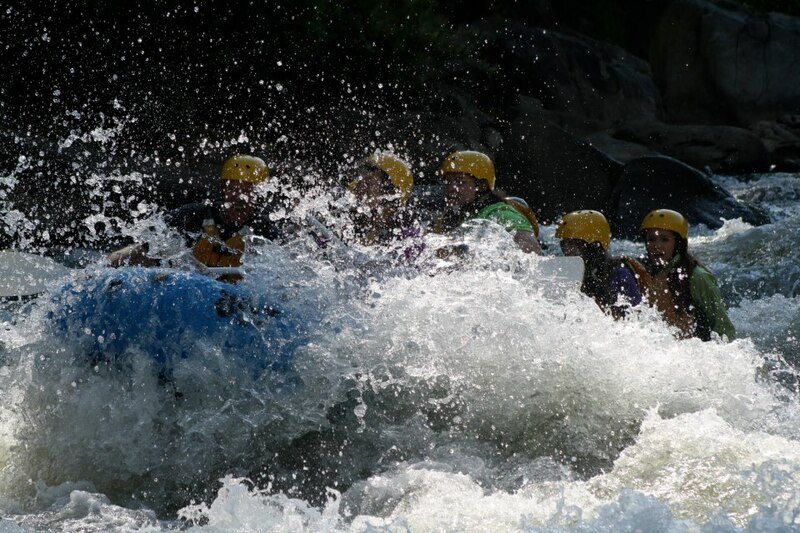 When it came time to brace for a rapid, the guide would yell, "All in - Forward!" This meant all of us had to immediately throw in our paddles and put some muscle behind it to power the boat ahead. Momentum helped us avoid being caught up on obstacles. Towards the end of our trip, we were coming up on a rapid called the “Rock Garden.” It was a series of countless rocks ranging in size creating a very tricky path through the obstacles. We were about halfway through when our boat ran up on a fairly large rock and got stuck. The water was raging around us as we tried to shift our weight and push off the rock… it turned into a five-minute rescue mission. Here in lies my spiritual lesson of the week: What are the words, situations or circumstances in your life that have ran your boat up on a rock and left you stranded with raging rapids all around? Each night of the retreat we sang “With One Word” by Shane and Shane. The song was written as a result of one family member being diagnosed with a serious illness. Often there are words in our life that are capable of running our ship aground; they can change the past as well as the future. The song points us back to the one, powerful word of the name JESUS. Often we forget how transforming that name is. Words that have ran my boat up on a rock: Cancer. Died. I don’t love you. Your hip will interfere with my active lifestyle. War. Get over it. You’re not good enough…. As I share my own, I am sure you have thought of a list of words that have not only altered the past as you knew it, but the future too. These words are powerful and have the ability to drain the air from your lungs as well as the hope from your heart. These are the words that can run you up on a rock in the middle of a rapid. Truth be told, we were stuck on the rock for quite a while and I was beginning to get concerned. All seven of us in the boat tried to shift our weight; we tried jumping up and down; we tried pushing with our paddles… finally, some of the men in the boat sat along the side as we held on to their life jackets and pushed off. It was messy and took some time but finally we were free to bounce down the rest of the rapid. 1. Stay there – you will eventually die due to a lack of food and water. 2. MOVE! – It will take work, it may hurt, and there will still be rapids ahead but you can choose to get unstuck. Our Christian walk is much like bounding down a river full of rapids. At times the water will be glassy and still and other times are full of waterfalls and rocks big enough to knock you out of the boat. Of course there are situations in life that have the potential of causing us to become stuck on them, yet God gives us the choice to linger there or to fight forward. The last six months for me have been a slow and steady fight forward; I don’t want to die on the rock. You can cry all you want, yell for help, pout… but ultimately, the only one who can help you get off the rock is yourself. Many other boats passed us as we were held captive by the large rock. They themselves were trying to navigate safely through the rapids. Stopping to help us was not only dangerous, but nearly impossible. If you are crying on a rock – A. you look like a blubbering, beached whale. B. you have the power to do something about it. Through the grace and strength provided by our Heavenly Father, we can move forward. Do I still hurt? Absolutely. Are there still days when I want to give up and just sit in the boat and cry? More than you know. Whatever your “rock,” it is ok to get hung up on it for a moment. Say a prayer; gather your strength and fight to push forward. God has not designed you to fail or to become a rock ornament. You are a navigator! An excellent sportsman of life! An adventure person! A trailblazer! Through His love, He gives you the Grace to move forward. Nothing can separate us from Him unless we allow it. Take your faith and get your leg out of the boat and push off as you scream the all-powerful name of JESUS! The supernatural strength He provides is sure to leave you in awe. "All in- FORWARD!"